There’s excitement and hands-on play opportunities for all ages – from tiny tots through to adults who have never lost their sense of wonder. Giant Light Bright– grab a bunch of colourful translucent acrylic pegs and slot them into the over-sized black pegboard that’s backlit by an LED light source – what marvellous combinations of patterns can you create? Rainbow Shadow Disco – take your best dance moves into another realm under the colours of the rainbow! Bathe yourself in a gorgeous spectrum of colour as you groove to the cool beats and funky tunes. This is disco like you’ve never experienced before! Light Bubble Forest– let yourself be spellbound by thousands of bubbles in illuminated 1.5m high columns. Watch the flowing, colour-changing bubbles as they cascade in liquid – it’s a soothing sensory experience for all ages and abilities. Then experiment with bubble games on bright light tables and see what you can conjure up. Plus get hands-on with our permanent installation Luminous– by day it may look like a regular office building, but under the cover of darkness it will surprise and delight, revealing itself as the world’s largest interactive light installation! Program the light display the way you want it via the consoles on the Village Green North and South – it’s public art, play and communication all rolled into one! 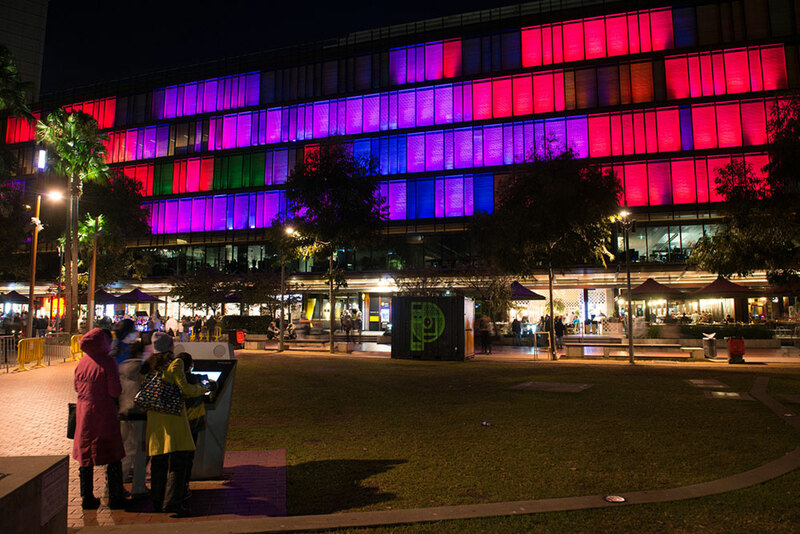 Presented by Darling Quarter, LIGHT PLAYGROUND and LUMINOUS are free to the public and will flicker to life for 14 nights from Friday 25 May until Sunday 16 June (activated each Thursday to Sunday from 6pm until 9pm).